Inventory We are a resale marketplace, not a box office or venue. Ticket prices may exceed face value. This site is not owned by Les Schwab Amphitheatre . 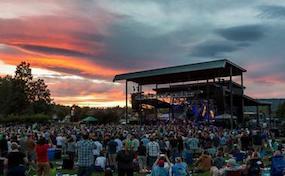 The Les Schwab Amphitheatre has become an iconic venue to the local residents of Bend, OR. Although relatively small in size it have brought some of the biggest names in summer concerts through the Old Mill District. Tickets for big acts like Dave Matthews Band, Coldplay, Paul Simon, Bob Dylan, and Jack Johnson have almost becmoe an annual tradition. The current seating capacity is 8,000 and opened in 2001. LesSchwab.AmphitheatreBend.com is not affiliated with any primary vendor or box office. We are a privately held company that specializes in providing a large supply of online inventory at the lowest prices. To purchase tickets to any Les Schwab Amphitheater Bend, Oregon events simply click on the event of interest or call our operators at anytime.